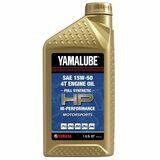 Dr welby - Tulsa ok Yamalube "Fast shipping, the best oil for my super tenere"
Phil - Phoenix, AZ Good Product; Great Price "Been using this oil since first change. I assume it will continue to do a good job. The price was the best I could find on the internet. Was delivered quickly too."